The Little Dippers Crock-Pots are perfect for warm dips and sauces. They are great for entertaining, game day, and family game night. I liked mine so much, I got another. One has an ivy design and the other a Southwestern design, so popular in the 1990s. If you like to entertain, I highly recommend these little Crock-Pots! 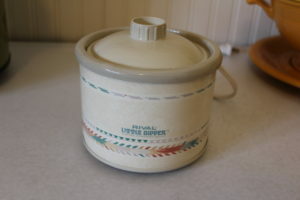 My Southwestern design Little Dipper Crock-Pot. Great for warm artichoke and spinach dip!